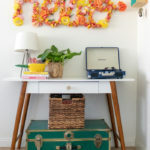 Today, let’s talk about Mother’s Day! It may be a Hallmark holiday but it’s still important to celebrate moms (especially MY mom!) 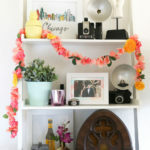 and flowers are always a beautiful go-to gift idea. 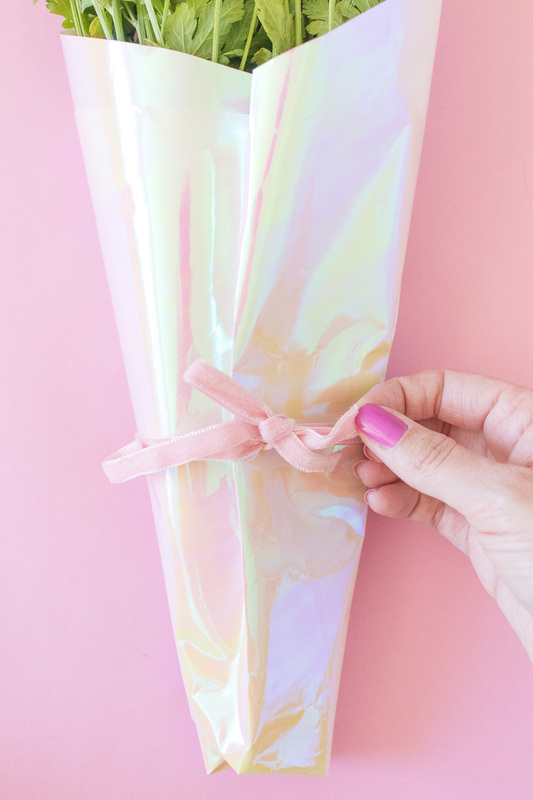 Rather than settle for the typical grocery store bouquet, I’m going to show you how to wrap a bouquet of flowers with wrapping paper for a cute upgrade that anyone is sure to appreciate. 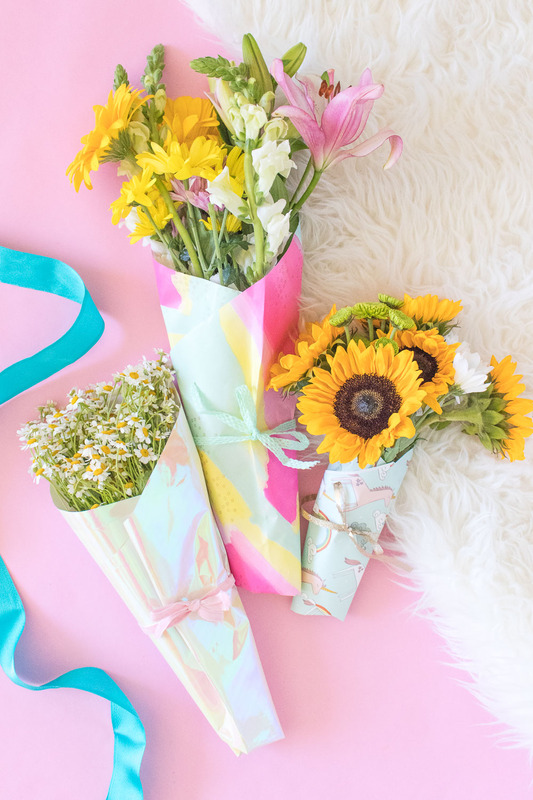 Grab a colorful or whimsical roll of wrapping paper and quickly wrap a bouquet of flowers tied with a ribbon for an easy gift idea that is perfect for any occasion. I’m a hoarder of wrapping paper (among so many other things), so I dug around the closet to pick my three favorites. 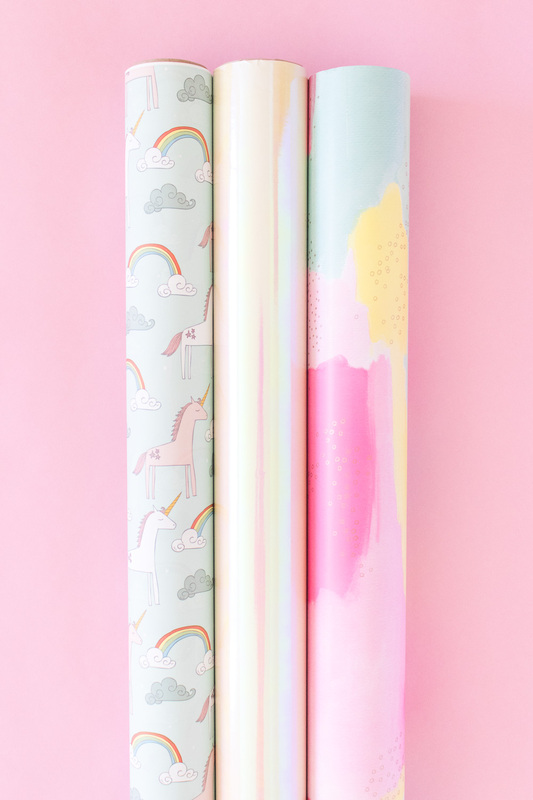 One of my favorite places to find cute wrapping paper is Tuesday Morning, which is where I purchased both patterned papers. 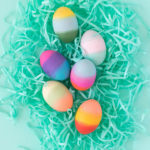 The holographic paper is from Target. You’ll also see that I use a damp towel wrapped with plastic wrap around the cut flower stems. This can help them stay fresh a little longer, especially while you’re traveling with them or the receiver can’t get them in water right away. 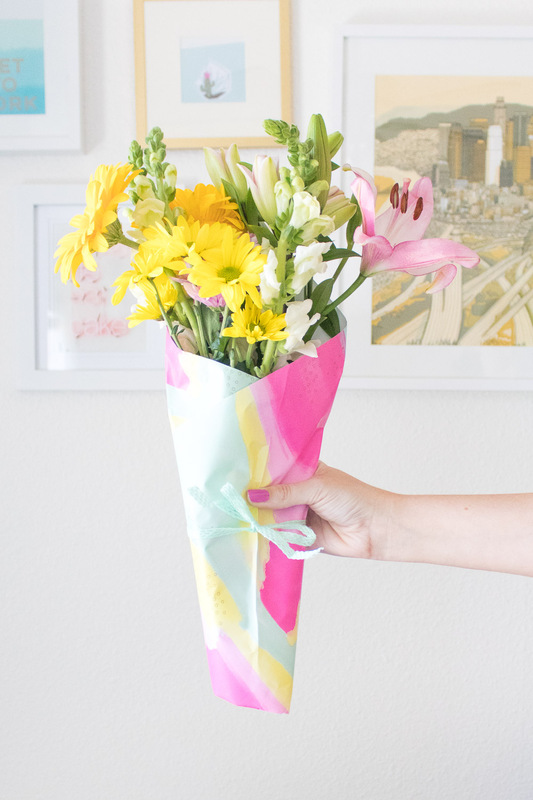 Now go find your favorite paper and get to wrapping that bouquet of flowers! Step 1: Trim the stems of the flowers. Step 2: Cut a square piece of wrapping paper approximately proportionate to the size of the bouquet. Place face down at an angle. Step 3: Place a piece of plastic wrap on top, then a damp paper towel. The plastic wrap must be larger in order to prevent the towel from leaking into the paper. 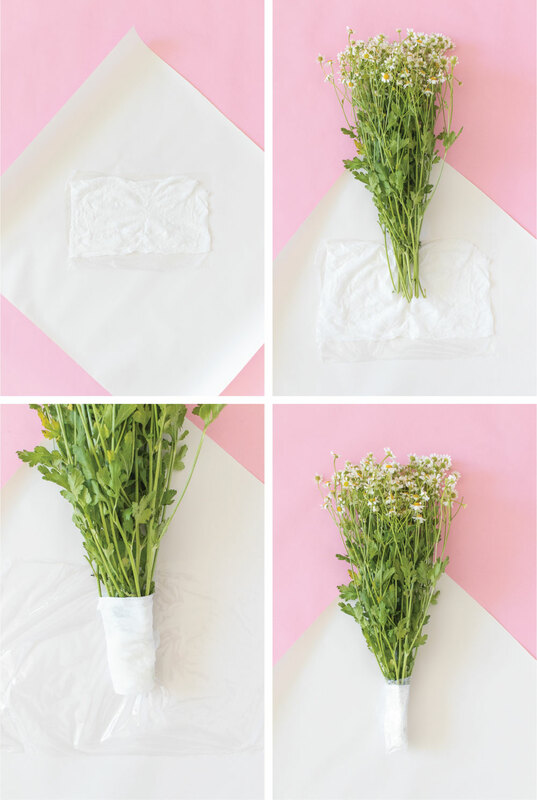 Step 4: Place the flowers on top and wrap the bottom of the stems in the wet towel and plastic wrap to keep them fresh until you can gift them. Step 5: The flowers should be placed at a corner of the wrapping paper. Fold up the bottom to flatten. Step 6: Fold the bottom up so that it meets the middle of the flower stems. Step 7: Fold over one side and tuck slightly. Then fold over the other side and tape to the back of the bouquet to secure. Step 8: Wrap ribbon around the middle of the wrapped flower bouquet and tie in a bow. If needed, add a piece of tape to the back to prevent the ribbon from slipping. 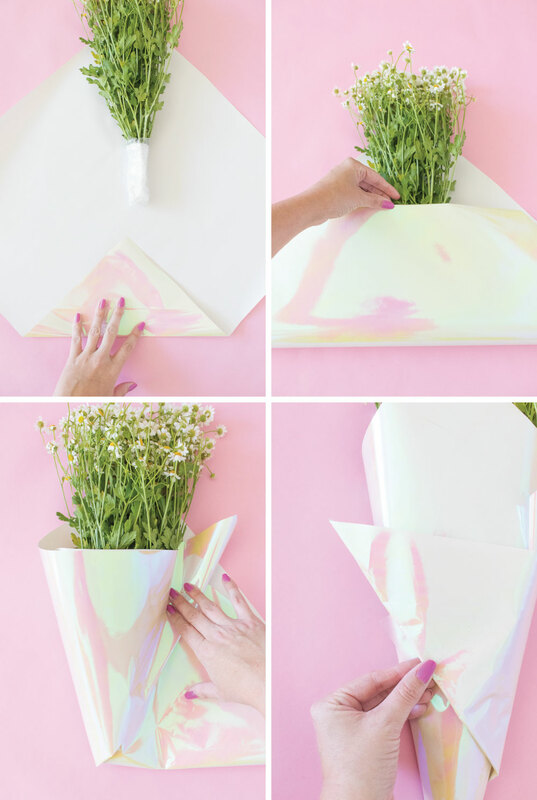 Now you know how to wrap a bouquet of flowers! Trust me, it’s very easy. 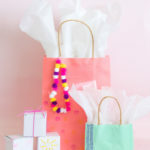 I just love how a fun patterned wrapping paper can give new life to any bouquet of flowers!